The unique design of the single-seat F-117A provides exceptional combat capabilities. About the size of an F-15 Eagle, the aircraft is has a conventional aluminum, titanium and stainless steel rib and stringer semi-monoque structure. Externally, this unique aircraft is composed of numerous facets to direct radar energy away from the emitter, much like the design of the Hopeless Diamond model Have Blue vehicle. In order to lower its Radar Cross Section (RCS), leading and trailing edges are composed of non-metallic honeycomb structures and the entire aircraft is covered with a thin layer of Radar Absorbent Material (RAM). The “V” shaped twin tails are graphite thermoplastic composite structures. All openings in the aircraft (engine inlets, vents etc.) are covered with grids or screens to reduce radar reflection. In order to reduce cost and speed development of the F-117, off the shelf hardware was used some cases. Two 13,000 lb. thrust class General Electric F404 non-afterburning turbofan engines derived from the Navy F-18 power the aircraft. The aircraft is also equipped with an F-18 derived Auxiliary Power Unit (APU) to permit self starting of the main engines and provide backup electric and hydraulic power. Its quadruple redundant fly-by-wire flight control system, critical to flight of this inherently unstable aircraft, is derived from the F-16. Three IBM mission computers, derived from those used on the Space Shuttle, drive the complete avionics suite. Modern digital avionics is the heart of this precision bombing platform, increasing mission effectiveness and decreasing pilot workload. 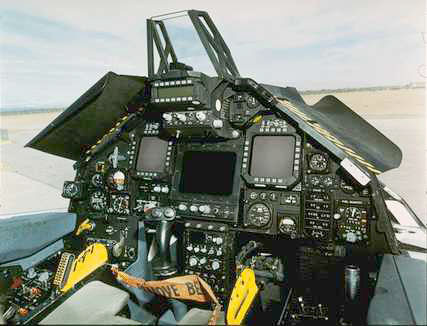 The F-117 cockpit is equipped with Heads up display (HUD), twin color multifunction display indicators, and a digital moving map system. Navigation duties are handled by a state of the art Ring Laser Gyro (RLG) and Global Positioning System (GPS). To perform its night bombing mission, the Black Jet utilizes an Infra Red Acquisition and Designation System (IRADS) with forward and down looking capability. The laser targeting function of the IRADS guides the array of precision laser guided munitions carried by the F-117 with deadly accuracy. Although this aircraft can employ a variety of tactical and precision munitions, the weapon of choice is the laser guided GBU-27, a 2000 lb. penetrator with a hardened steel case, developed specifically for the F-117. With its ability to penetrate over 6 feet of reinforced concrete, destruction of command and control bunkers and hardened aircraft shelters is standard duty for the Black Jet. Detailed planning for missions into highly defended target areas is accomplished by an automated mission planning system, developed specifically to take advantage of the unique capabilities of the F-117A. This sophisticated system, utilizing high speed computer technology, calculates the most survivable flight path in and out of the target area. Air refuelable, the F-117 can support worldwide commitments, and stands as a formidable deterrent within the U.S. military forces. The F-117A program has demonstrated that a stealth aircraft can be designed for reliability and maintainability. Aircraft maintenance and mission capability statistics are comparable or exceed those of other tactical fighters of similar complexity. Additionally, the Black Jet is kept at the forefront of technology through a planned weapon system improvement program. Now in its seventh Configuration Upgrade program, aircraft from the 49th Fighter Wing are cycling back through LM Aero facilities in Palmdale CA for a major improvement to the Low Observable system, along with enhancements to the Stores Management System and Operational Flight Program (OFP) software, enabling the F-117 to carry a new class of GPS guided munitions. Future upgrades are planned to expand the Nighthawk’s mission capability and avert hardware obsolescence in the avionics suite. The F-117A Nighthawk is the world's first operational aircraft designed to exploit low-observable stealth technology, enabling survivable penetration of dense threat environments and attack of high value targets with pin point accuracy. Utilizing its stealth capability in an armed conflict, the F-117 will be tasked with “first night” missions to attack and destroy enemy command and control centers, air defenses and weapons of mass destruction. The precision bombing capability of the F-117 enables battle- field commanders to destroy these high value targets with minimal collateral damage and unnecessary loss of life. Following the initial Nighthawk raid, conventional bombers can be employed with the threat now minimized.